Before delving into the Newfoundland temperament and personality, let’s take a moment to get to know a little more about this sweetheart of a dog. The Newfoundland, or “Newf,” is a “working dog.” Other types of working dogs include the Golden Retriever, the Great Dane, and the Siberian Husky. The Newfoundland Dog’s history is as a working dog for fishermen in what is now Newfoundland, Canada. This makes Newfoundlands rather skilled at performing water rescues. This is due, in part, to their muscular body structures, thick double coats, webbed feet, and inherent swimming ability. The Newf likes to drink water almost as much as she likes to swim in it. Though she can be pretty messy when it comes to drinking, so you may find yourself cleaning up after her drool rather often. Something to note: male Newfoundlands, not always but occasionally, can become aggressive with other male dogs. A few of them may also become dominant and aggressive toward humans, and shyness can also become an issue if you do not socialize your male dog from the beginning. The Newf Is a BIG Doggie! Some Newfs have weighed in at over 200 lbs.! In fact, the largest one on record was 260 lbs. and measured in at over six feet from nose to tail! As far as their height is concerned, Newfs usually reach between 22 and 28 inches, if you measure them at the shoulder. 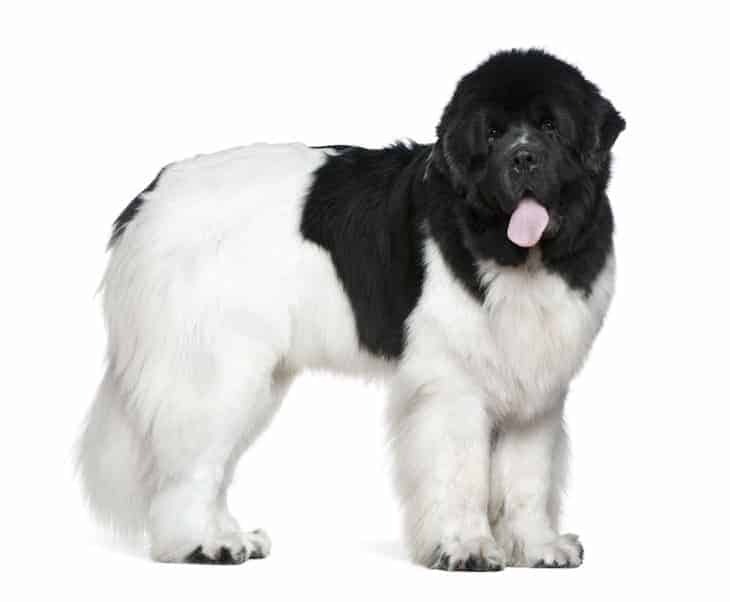 Despite being a strong, big dog, the Newfoundland temperament is closer to that of a teddy bear than a lion. The Newfoundland is a gentle creature, renowned for her calmness and docility. Because of this, Newfoundlands are fantastic to have around children. However, because she can grow to be rather large at a younger age, you must watch her with small children to ensure that she doesn’t accidentally lean on them or knock them down. Considering her measurements, it’s a relief to know that the Newf doesn’t have a penchant for using her weight and height aggressively. Could you imagine that much dog taking off after you? Yikes! Though she may be huge, she ambles around rather slowly. The Newfoundland’s sweet nature also makes her a pleasure to be around. She has a deep bark, which is ironic considering her laid-back attitude, and she is normally very loyal to her masters. She typically doesn’t break out the bark unless she feels it’s necessary. She’s even good around other dogs and animals, but her size can cause issues if you do not properly train her. Should an intruder barge into your home, the Newfoundland will essentially place her under citizen’s arrest. The Newf is more likely to either pin the intruder into a corner or put herself between the unwelcome guest and her family until help arrives, rather than go in for the kill. Even more impressive, the Newf has an innate sense for who is a threat to her “pack” and who isn’t. So, if she doesn’t feel you’re a threat, she’ll leave you alone. Newfoundlands are normally easy to train, but you must, as with most other dogs, start them young. You can almost never go wrong by showing your dog the ropes as early as you can. The sooner she learns the rules, the happier you and she will ultimately be. As with many other breeds, the Newf will get along better with other dogs and animals if you give her plenty of opportunities to socialize with them from a young age. Keep an eye out for even the smallest signs of aggression so you can train her on how this is not an acceptable way to behave. Speaking of training, the Newf is a joy to train because she’s outgoing and always interested in learning something new. If you are interested in training your Newf to master water rescues, you need to start no later than when she is four months old. Newfs respond well to gentle guidance. She trusts you with everything she is, and she adores the attention of her masters and wants to please them. Do not use harsh training methods, else you risk breaking her spirit. And while she is “trainable,” she is not born with it. Once you help her understand what you expect from her, that’s when the ease of training her will kick in. For help with training your Newf dog take a look at The Online Dog Trainer by Doggy Dan. Doggy Dan is an expert Dog Trainer based in New Zealand. His online resource contains Hundreds of Excellent Dog Training Videos that will take you step-by-step through the process of developing a healthy, happy well-behaved dog. Research shows that Newfoundlands are related to other Canadian Retrievers, including the Labrador and Golden Retriever. Fishermen used both types of dogs to pull fishnets. However, because of her larger size, the Newfoundland also had a use for pulling carts and other heavy equipment. 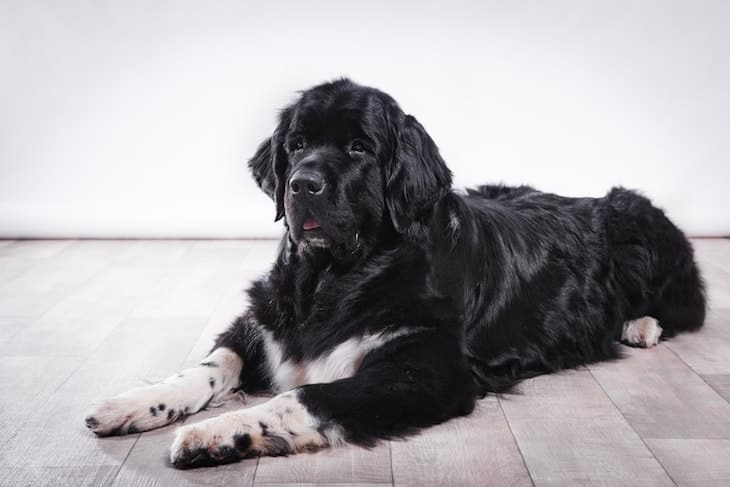 The Newfoundland can also succumb to a common heart defect known as Subvalvular Aortic Stenosis, or “SAS.” With SAS, the dog is born with defective heart valves. Sadly, SAS can cause the Newfoundland to pass away suddenly, and at a young age. However, healthy Newfoundlands can live, on average, from 8 to 10 years, with the latter being the typical life expectancy. The Newf has a heavy coat and, as such, you need to brush her at least once a week. She has shedding seasons about twice a year, and during these, you will need to brush her every day to prevent tangles and mats. Spayed and neutered Newfs, on the other hand, tend to shed more often, no matter whether it’s shedding season or not. You need to brush a spayed or neutered Newf several times a week. And, of course, keep her nails short and manageable. If her nails grow too long, it becomes more difficult and uncomfortable for her to get around. You must exercise your Newfoundland at least a half-hour every day to keep her happy and healthy. She loves to be outdoors as much as she loves to be indoors, so take her for outdoor activities like hiking, swimming, or a long walk. The Newf loves to work, and she’s a natural at rescue missions. She also likes to pull carts, so you can devise a number of games and challenges for her to enjoy. Did I mention she loves to swim? So you've decided that you'd like to add a Newfoundland puppy to your family. That’s great! You can find a Newfoundland for sale either from a breeder or through your local rescue or adoption agencies. The average Newfoundland price is between $1,000 and $2,000, on average. Keep in mind, though, that this is just the price of the dog. You also have to account for the expenses you’ll incur for the dog’s food, medical care, and accessories. If you’re looking to save a few bones (no pun intended), you can look into adopting a Newf, which is typically the more affordable option. If you want to adopt a Newfoundland puppy, you may be able to find one at your local animal shelter. If you are open to one of the adorable mixed breeds containing a Newfoundland, then your odds of being able to adopt shoot up considerably. This is because more mixed breeds end up at the shelters than purebreds. There are a number of perks to adopting a dog. For one thing, you get to bring a dog home that would have otherwise felt cooped up, living in a cold shelter with no family to call her own. For another, when you adopt an older dog, you get to skip all of the annoying and destructive phases of owning a puppy. Either the shelter or his former owner has house-trained him, so you don’t have to worry about that, and he has, more than likely, outgrow his chewing stage. 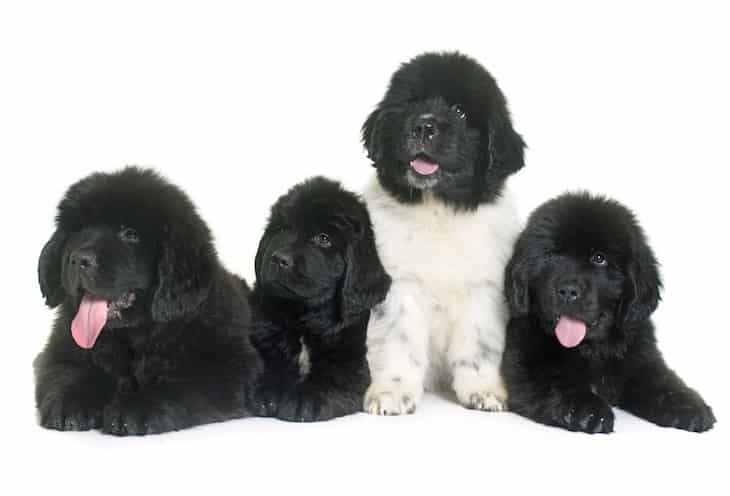 If you want to buy a Newfoundland puppy from a breeder, your first step should be researching the breeders local to your area. Check out their profiles on social media to find out what their customers really think about them. Always be wary if you see too many positive reviews and no negative reviews. Some breeders may pay or otherwise incentivize feedback so as to appear more reputable than they are. You can also look into some of the official websites for the breed. Typically, these sites list breeders that they can personally recommend as being above-board. Once you decide on a breeder, pay attention to the premises where the breeder raises the dogs. Is it clean or dirty, spacious or crowded? Look for any clues that the breeder may be encouraging aggression in the dogs, or refraining from addressing and conquering an issue that one of their dogs may have. Is the Newf Right for You? If you love big dogs, especially gentle giants, then you should have no problem falling in love with the Newfoundland temperament. She is the very definition of a big, lovable oaf. With her lumbering gait she is more likely to corner an intruder than attack him. Just be careful with her around younger children. While she may not mean to, she could end up injuring them in not realizing where she’s walking and knocking them over. That being said, der sweet disposition, willingness to train, and gentle mannerisms all make the Newfoundland temperament a joy to experience.